Intensity Shuttle for USB 3.0, the world’s first 10 bit HD/SD editing solution for USB 3.0 computers! 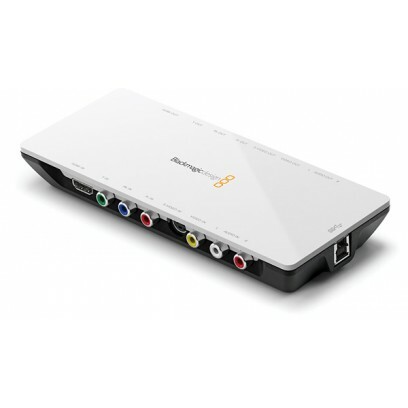 Simply plug in Intensity Shuttle and get access to incredible quality 10 bit HDMI, analogue component, composite and S-Video capture and playback. Intensity Shuttle’s innovative design is compact and portable, plus you can plug inline with your cables because input connections are on one side, and output connections on the other! Intensity Shuttle powers from the USB 3.0 connection so you don’t need cumbersome power supplies. Intensity Shuttle comes ready with advanced video technology such as HDMI and 1080p electronics, so it will grow as faster high performance USB 3.0 computers are released in the future! USB 3.0. Requires an x58 based motherboard with onboard USB 3.0, or a USB 3.0 PCI Express card and an x58 or P55 series motherboard. Please check the Blackmagic Design Support pages to see the full system requirements.